This quilt was in one of the magazines just about three years ago and it caught my eye. Something about it is so fetching - it is simple and very sweet. Over the last couple of years I have thought about doing it several times. So this afternoon that is what I did - found some charm squares I have and some white on white fabric and started cutting out birdies. I actually reduced the size of the blocks from about 9 inches to probably around 7 inches. Instead of doing them on individual blocks (the momma birds are on one and there are two babies on each of the remaining blocks in the rows), I will do them on a strip. Messy, as usual. The size will be around 28 by 35 so would make a cute wallhanging. Still have lots of wings to decide on but was getting a bit weary. Next time I go down, the pieces will kind of make known where they want to be. 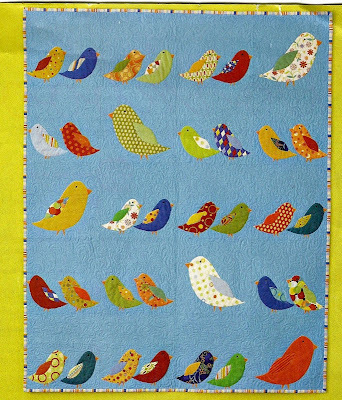 The birdies are just lying on the fabric and will not be squeezed together like that. Before I do any fusing, I may see if I can find some white with teeny tiny black dots - thought that might be pretty. Will just bind it in binding made from sewing pieces together for a scrappy look. All these little birds will have orange beaks, feet and little black eyes. I may make the wings a bit bigger, too. Will just have to see. How very cute!!! Elle and I like. Going to be a hot one tomorrow at High School Graduation. Such a sweet pattern, can't wait to see your finished birds! Those are adorable, grandma! Can't wait to see how they all turn out.